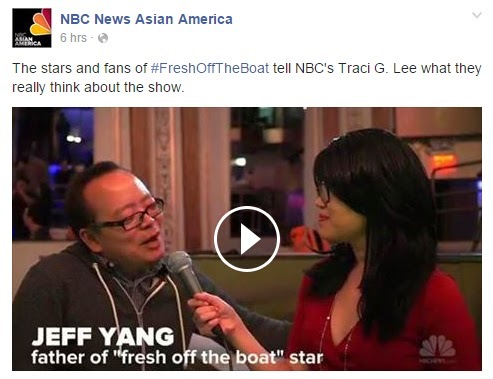 I've been approaching ABC's Fresh Off the Boat with cautious optimism since last summer when the show was announced. I love Eddie Huang's book, his voice--everything that makes the story what it is. It isn't a story I personally relate to, but there are moments scattered throughout his memoir that resonate with me and reflect personal experiences too. When I heard ABC was turning it into a sitcom, I was excited, but nervous. I didn't want to see the flavor of Eddie's voice disappear. But along the course of reporting and watching its production and development, I began to get excited. When the cast was unveiled, I got even more excited. I'd been waiting for a show like this my whole life. Last February, I wrote about never seeing a family that looked like mine on TV when I was growing up. 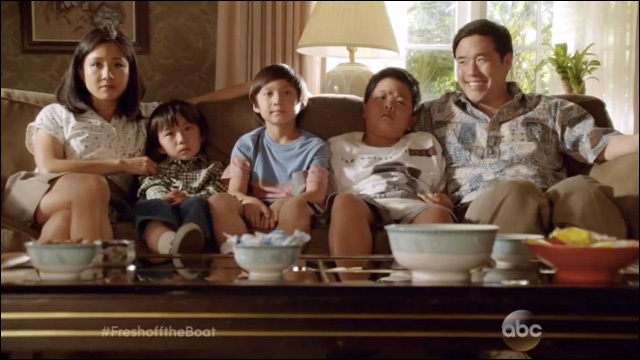 Fresh Off the Boat was the representation I'd been craving for years. Disclaimer: I'm not a television critic. There was no way I would even attempt to be one. I'm an observer of the community, and I want to continue to be one for as long as my career will allow me. On Wednesday night, I covered a watch party in New York City for the two-episode premiere of the show that was attended by the cast and crew of the show, along with more than 1,000 fans. I was watching the show, but I was also watching the faces of the people around me. Their faces reflected the excitement and emotion I felt inside. I took a breath as the second episode was ending, put down my reporter's notebook, and focused on the projectors. Louis grabs a basketball and asks Eddie if he thought he could take him on. They play, and the two younger Huang sons run out to join them with permission from their mom, Jessica. As the four are playing, the neighbor's kid passes by and Eddie invites him to join. Jessica watches all this from the window, smiling. That moment, paired with the moment from the pilot when Louis and Jessica stand up for Eddie at the principal's office after Eddie beats a kid up for calling him a chink, is something I get: it's not about how often your parents tell you they love you because waiting for them to say it wasn't the point. But you could be damn sure they'd show they loved you. I was watching Louis and the kids play basketball and it was like someone had placed warm hands over my heart. Growing up, we had a basketball hoop on our driveway too. Na and I weren't particularly good at sports, but we had fun and we were encouraged by our dad to enjoy it. We played badminton outside too, rode our bikes around the cul-de-sac and to/from piano practice, played frisbee on the sidewalk. We didn't have a large social network, nor were we particularly close with all of our neighbors. But it never felt lonely; we had each other. I paused to let myself be a part of the historic moment of what Fresh Off the Boat meant to a community often overlooked by the mainstream, and what the show also meant to me personally--and it was overwhelming. I've been the kid whose classmates made fun of her "ethnic" lunch, who just didn't eat because being hungry was better than being laughed at when you're in 3rd grade and just trying to make friends. I've been called a chink. 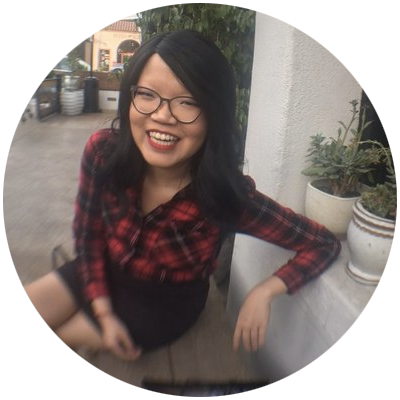 I've also been pushed into a model minority box, and overlooked when trying to break out of it and just be myself. There's so much about Fresh Off the Boat, the sitcom, that speaks to me as a child of immigrants and as an American kid just looking for an ally out there on the playground. And while the show is not without its minor faults (I'm still not crazy about the accents), it is certainly filled with so much heart that it's impossible not to smile. I hope it will continue to have its place on a network that, 20 years ago, rejected another Asian American family. When we ask the question, “Where is Asian America?” it’s important to clarify that our existence has never been in question in this country: despite the attempts to keep immigrants out, to keep our ancestors out, we’re here. We’ve been here. And after decades of letting others decide what mirrors we were allowed to look in and how we were seen and what words defined us, the most powerful way to tell our stories is not to carry the burden of representation alone, but to enter the spaces that originally were not intended for us and to use our voices and our alliances to transform the media landscape into a place where representation is no longer a question, but a fact.